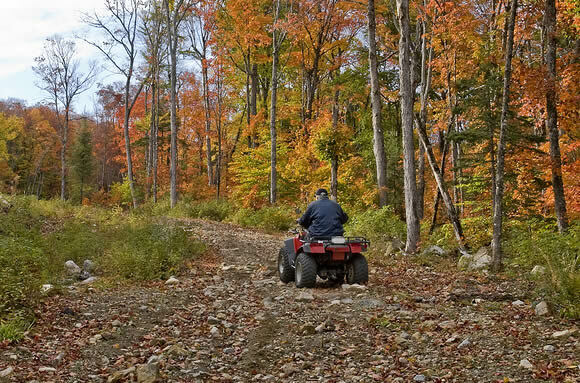 The ATV trails on National Forest System lands are managed by a trail class system. The Bayfield County ATV map can help in planning your ride or learn more about what trail classes are and what sections of trails are identified per each class. Just a reminder that the ATV trails on the Washburn Ranger District are only open to 50 inch or less wheeled UTV’s at this time. If your measure from the outside of one tire to the other and it is over 50 inches, your UTV is not legal for use on the Washburn Ranger District, with the exception for the Drummond Connector Trail. Please ride responsibly and within your skill level for trail conditions. Stay on the Trails at all times. NO Off-Roading. Riding on any Lettered or Numbered Road is not Permitted. Check out the following links for ATV information! All ATVs not registered in Wisconsin are required to obtain and display a nonresident ATV trail pass in addition to your home state registration. This trail pass must be permanently attached and visible near the forward half of the ATV. Cost is $35 and can be purchased where fishing licenses are sold. Remember, ATV usage is limited to designated roads and trails. No overland “cross country” travel is allowed. Crossing or going around berms, gates or other road closure devices is prohibited. Vehicle travel on ATV trails is also prohibited. PLEASE RIDE SAFELY WHILE ENJOYING OUR BEAUTIFUL AREA!